Actively monitor user experience in production applications. Keeping users content and engaged must be an integral part of the software delivery process. Once deployed, staying ahead of performance issues means applications must be continually monitored to validate customer expectations are being met. Capture the user experience using a dedicated point of presence (POP) to execute synthetic, prerecorded business transactions. Take the user perspective to find your weak spots with tests that use multiple browsers, devices, network bandwidths, and geographic locations to capture diverse configurations. Simulate typical user transactions and verify if third party components function properly using realistic behavior such as logins, filling shopping carts and checkout. 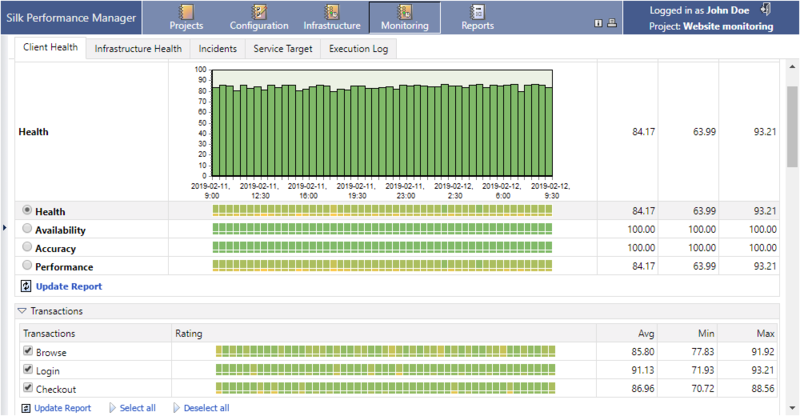 Use Silk Performance Manager to closely monitor live service levels of web, CRM or business applications. Re-use pre-production load tests to create baseline performance references.